The rapidconnect Loose Tube Fibre Optic Cables are manufactured in Australia for Australian conditions. Whether this be Nylon Jacketed, a PE Sacrificial Sheath, available to be used as part of the rapidconnect 25 Year Enterprise Cabling Infrastructure System Warranty for your added piece of mind. The Corrugated Steel Tape provides rodent protection along with excellent crush and impact resistance. 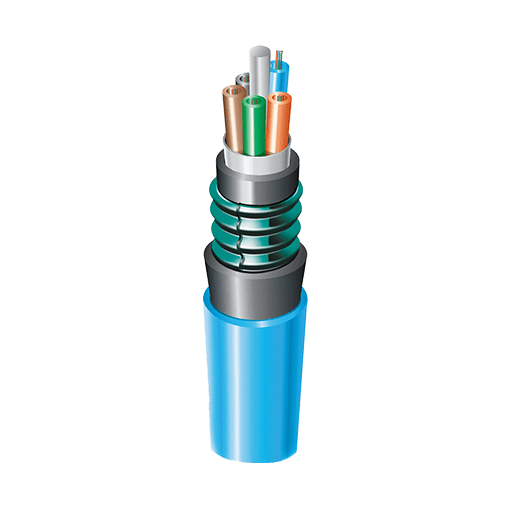 The C Series cable is ideal for direct burial in the ground and other external applications where higher protection is required. The Blue outer Nylon Jacketing is designed to provide protection against termites and reduces friction during hauling between cable and duct at the same time. Internal dry water blocking technology improves the working environment whilst simplifying the work site clean-up. Additionally Dry Water Blocking prevents water migration in the event of a breach in the sheath. Anderson has a wide range of OM3, OM4 and OS2 Loose Tube Fibre Optic Cables carried in stock, however, should you have a large requirement then our manufacturing lead times are unmatched and we can deliver directly to your nominated site should you need. All rapidconnect Loose Tube Fibre Optic Cables are available to be used as part of the rapidconnect 25 Year Enterprise Cabling Infrastructure System Warranty for your added piece of mind. The rapidconnect Loose Tube Fibre Optic Cables are manufactured in Australia for Australian conditions. Whether this be Nylon Jacketed, a PE Sacrificial Sheath or whether it is offering a 100% Rodent Proof Loose Tube Fibre Optic Cable. Rapidconnect Loose Tube Fibre Optic Cables can be manufactured with the addition of an optional Black PE (Polyethylene) Sacrificial Sheath. This is often used where the integrity of the Nylon Jacket must be retained thereby retaining its termite proof capabilities.